Having Rack, my faithful McNab Puppy alert to dogs across the street, I'm getting used to his perking his ears, looking at the door, and walking over to it with tail wagging. It's possible to tell if it's one of the neighbors with their dog or something very different by the way Rack will react toward the door. He's fond of the neighbor's Rottweiler, named "D.O.G.". Yes, a 140 pound dog named "Dee Oh Gee" that sees us and wags his stump of his tail from the edge of the property hoping for a hello. This morning was different. I was in the middle of making breakfast. Home Made English Muffins, egg, sausage, and cheese with Home Roasted Coffee, when Rack alerted to the door. Finishing up the sandwich, I turned off the burners and walked to the door. Rack was sitting there, wagging his tail and dusting the floor, head slightly cocked to the left. As I got to the window at the top of the door, I saw this bird across the street going through some odd motions. Getting closer to the subject, I realized that we were sharing a morning meal. 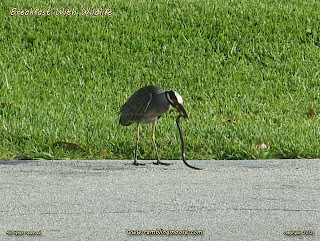 We live fairly close to wildlife here in Wilton Manors. Seeing armies of ants going from Point A to Point B is an almost daily occurrence that hopefully isn't across the kitchen counters. Flocks of Cherry Headed Amazon Parrots or Green Iguanas on the roof are now normal to me. I don't even notice Squirrels and Pigeons for the most part. 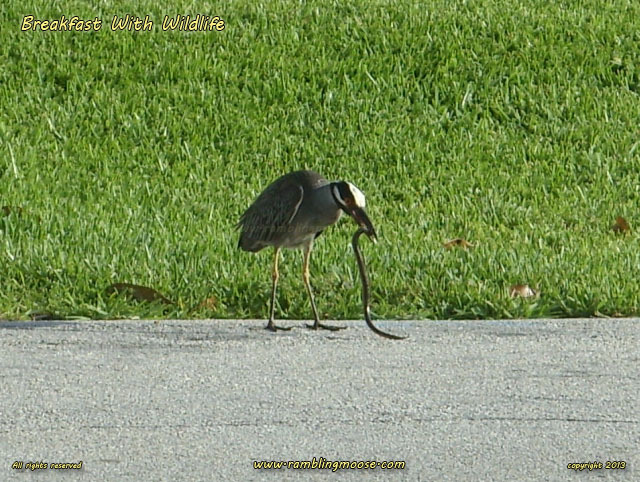 But watching this Egret doing a dance with the Black Racer against the pavement as he cooked his serpentine meal was a bit out of the ordinary. I reached down for the camera, wishing I had a DSLR and a Macro Zoom, and hoped that this would be enough. It was. I got off five shots and called it done, then returned to my breakfast leaving the bird to his. Rack wasn't getting any sausage sandwich or visiting with the wildlife this morning.